Zombie fans will know that the genre is anything but fresh, and while a little more alive than the scary side, there’s probably been one-too-many funny ones recently too. So when a film comes along that genuinely does promise something completely different for the world of the undead – even if that comes at the cost of the most jarring tonal shift possible – it seems only right that we shower it in all the praise it deserves. So here goes, One Cut of the Dead is up there with Train to Busan and Dead Snow as one of the best foreign-language zombie movies of the last twenty years. It is also a film that’s very hard to describe without spoiling pretty majorly though, so forgive me for proceeding with caution. In the simplest of terms, Shin’ichirô Ueda’s film is a love-letter to the very form it masters; a sparky DIY zom-com with a deliciously meta-edge that proves to be one of the most fun-loving and cleverly-shaped genre movies of 2018. A Japanese answer to Romero and Wright, with an even livelier premise. For at least half-an-hour, One Cut of the Dead is exactly the film you might think it is. A homemade one-take, one camera outbreak flick, pulled together by a van-load of rubber limbs and literal mop buckets of blood. A horror director at the very end of his tether finding his entire production falling apart at the seems, only for real zombies to descend on his attempts to make an outbreak movie. And even on that level, it’s hugely enjoyable fun. But when the camera finally cuts, it’s a totally different beast entirely. To spoil the reveal here wouldn’t just be unwise, it would be straight-up mean. And as jarring as it might be, given 10-or-so minutes to reconfigure, Ueda storms on and proves himself the master of not just one, but two completely different worlds; stapling them together like it’s nothing. It might come as a bit of a shock to the system at first, but when seen one after the other (and technically with a third over the credits too), the two halves of the whole make a thoroughly unique and massively entertaining picture indeed. A serious contender for “loveliest zombie movie ever made”, One Cut of the Dead is a totally different breed of genre picture, tying together tones and themes you might’ve thought ahead of time weren’t totally compatible with horror, and happily proving us wrong. 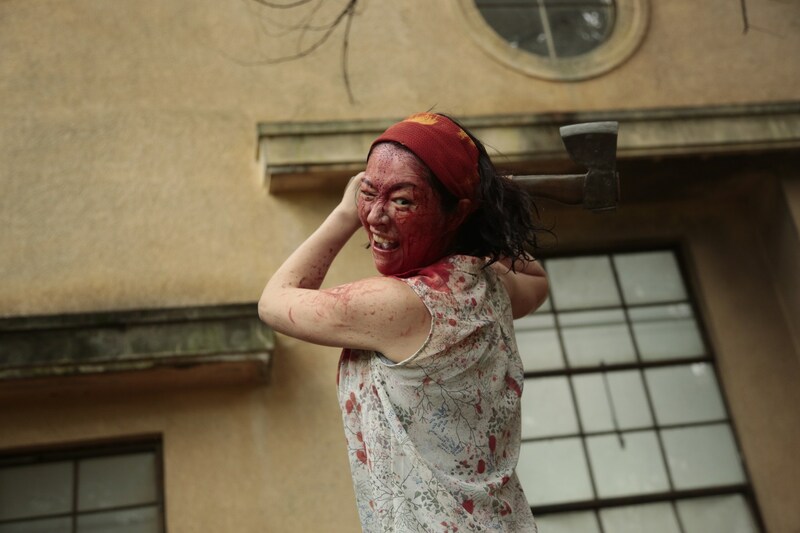 One Cut of the Dead was screened as part of Arrow Video FrightFest 2018.